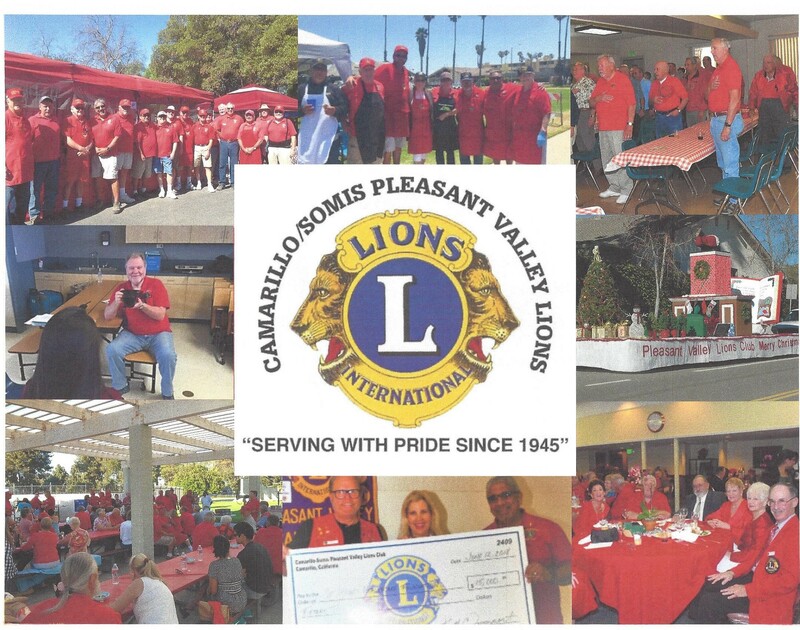 The Camarillo-Somis Pleasant Valley Lions of Ventura County, California are widely known for our "Lionburgers" but we do a great deal more. We are the Lions Club that manages the parking at the Ventura County Fair in August. We sell our "lionburgers", cheeseburgers, hot dogs, tri-tip sandwiches and roasted corn at the Underwood's Family Farm Haverst Festival in Moorpark the five weekends in October and again at the Underwood's Easter Festival. At the start of the school year we buy back-to-school clothes for under priveleged school children. We provide eye exams for many hundreds of school children througout Ventura County. We provide a very nice Holiday party for under priviledged children complete with Santa. And we work together with numerous other Lions Clubs in Ventura County on several health related projects. We are fondly known as "the Big Red One", and have been a frequent winner of the Number One Club Award in our tri-county district. To see more visit our other website www.pvlions.org.